We Cash For Cars Brisbane - Sell Your Junk Vehicle Today! Call us at or fill out our form to find out what your car is worth. Collect your payment when we pick up your car. It really is that simple! We are one of the most popular car dealers in South Brisbane Region. Our services of cash for cars are Brisbane Wide and taking care of Queensland wide. Picking up the damaged and scrap cars under the auto wrecking where the vehicles are dismantled and car bodies sent for recycling. Excellent opportunity for the owners of junk cars because “we cash cars” in Qld making it simple. There is no expert advice to be needed to get TOP Cash For Cars Brisbane because its all about the scrapping purpose and quotes are getting delivered through manual calculation. It is with the help of required vehicle details with the damage type. How we cash cars works? At “We Cash for Cars are known as Brisbane’s No.1 car buyers“, we also have highly qualified professional expert buyers who inspect your automobile and have a team of highly trained marketers who understand the value of the vehicle depending on the condition. Our three steps process is fast and straightforward. All you need to Call us and share your vehicle details. Our team will tell you the instant free quote, and if you accept the offer, then we will come to you and pick up your junk vehicle and pay in cash on the spot. With this highly qualified team, we aim to help you get the most from your car. With WeCashCars – we also buy the car in any state or condition and do not discount you on the status of the vehicle as a retail client would. Agree on a price, and you get paid cash Faster! Selling your car couldn’t be simpler. We’ll tell you what paperwork you need to bring: Your License No Roadworthy Required Registration Certificate We’ll Pay You Cash!We understand we are offering you a trade value, so we also recognise the condition of cars before selling to an end user. WeCashCars.com.au also allows the customer to sell his car directly from our office – so you don’t have to spend hours in queues, our team does everything for you. To know more about Where to Sell My Junk Car? SELLING YOUR CAR DOESN’T GET EASIER THAN THIS! We will also provide you with a free vehicle inspection and valuation followed by the best cash offer to buy your automobile. We provide a hassle-free and customer-focused way to get you instant cash for the old car regardless of the condition or year. while Our Experts will deal with all the paperwork, so the process is fast & straightforward, so you enjoy a cold/hot beverage. As a result, We will pay you top dollar cash on the spot and even clear your outstanding finance and provide 100% Free Vehicle Removal service at your doorsteps. We buy all types of vehicles with a focus on salvage, damaged, non-runners, scrap, and even cars that are not registered. As we support the RTA, we will handle all the paperwork with the help of our office guaranteeing a fast and hassle-free way to sell your car in Queensland. We are supported by the RTA guidelines to provide sales agreements to ensure a quick and effective vehicle transfer of ownership. We are confident that we can give you the best highest price that will meet any amount you have from anyplace else! Select your vehicle type from the choices below to learn more. First of all “We Cash for Cars Brisbane” is a part of auto recycling & Removals which pays top dollar cash for all types of unwanted vehicles from any make, model and condition. If you want the highest money for your junk cars, then ask for same day car removal service. Used Car Buyers Professionals will be at your location at your available time from all Brisbane Wide Regions Like Southside, Logan, Ipswich, Sunshine Coast, Northside. We are living in an era when almost every individual possesses a personal car. In Brisbane, people are dependent on their car as the population is growing faster in Brisbane because of its fit and luxurious lifestyle. Furthermore, it is becoming tough to reach a destination on time through public transport. It is necessary that people reach their desired destination. Within a specific time in today’s hectic lifestyle. That is why people depend on their Vehicle for transportation in Brisbane. But, no matter how strong and premium brand of car you use. The time has the potential to turn everything beautiful into a scrap. We also offer a wide range of wrecking services like cash for cars, free car removals, car wrecking and vehicle recycling in all suburbs of Brisbane. Finally, If you find out that your car is not in repairable condition anymore, then it will be better to sell it and buy a new one. Visit here to know What is my vehicle Worth? Or We Cash Cars Brisbane purchasing all types of cars irrespective of their condition for a long time now. We provide our services to Brisbane. And its entire suburb areas like Spring Hill, Northgate, Burbank, Cannon Hill, Bardon, etc. So, now you have the opportunity to sell us your car irrespective of your residential location in Brisbane. We also sell used car parts that are second-hand. If you are looking for Mechanical parts and body parts, you can find them here at our place at lowest prices. We also have the best quality second-hand used spare parts. To getting Top money for cars uses a simplified platform for dealing with their clients. If you want to know about it, go through the content given below. Our company also provides a free valuation of cars before even getting into the deal. What you have to do is to fill up the form on our contact page with proper details. Our experts will give you the best possible payable and an accurate price according to the data you provide us. If you agree with our price and want to proceed further, give us a call. Our experts will be at your doorstep to serve you with their expert knowledge. You can also schedule a pickup date according to your comfort. Our drivers with tow truck will be there for you on your selected day. After the finalization of the deal and clearance of the legal papers, we will pay you on the spot. There is no need to wait for the cash to get credited to your account. We provide same day payment along with same day pickup. First of all Your vehicle’s make and model is not a matter of concern about anymore. Our company Also deals with all types of makes and models of cars. Some of the famous car brands that you can sell to us are Subaru, Mitsubishi, Holden, Peugeot, Toyota, Mazda, Ford, Audi, Kia, BMW, Hyundai, Honda, Nissan, Suzuki, etc. You can sell us any model like cars, SUVs, trucks, motorcycles, boats, RVs, etc. Even the condition of the vehicle does not affect the deal. So, you can sell us a car that damaged, non-runners, scrap, and even cars that are not registered. As a result of Our company, We Cash Cars has straightforward paperwork that can be readily available for every car owner. So, We guarantee you that all the legal paper works related to selling the car or transferring the ownership etc. will do without any hassle. How can you save more money with us? With us, there is no need to worry about the removal of your vehicle. We Cash for Cars Brisbane provides free removal services to the entire areas of Brisbane and its suburbs. That’s good but how can you save more money? The answer is with the help of free towing. Our expert drivers will also remove your car at their own risk. Seems like no need to worry about extra hidden charges. You can also cancel your vehicle or boat registration online by visiting the Queensland Government website. We Buy All Your Junk Vehicles For Top Cash – Find Out How? 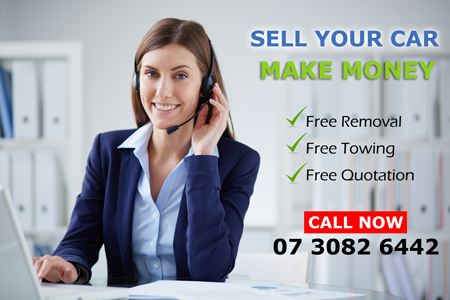 Get your vehicle ready to call us; We buy Old Vehicles for cash overall Brisbane regions for up to $9999 with free towing Service. We also collect vehicle Junkyards scrap of any make or model & pay the highest cash rate instantly call a Cash For Scrap Car Removals such as “We’re cash for cars Brisbane” for disposing of your vehicle and getting most top cash on the spot.Finally, get below information If you want to know more about Cash your car for permanent removals. After hearing so much about our specialty, you must also be looking for a way to contact us. All you can contact us for availing and our various services like cash for cars, car wreckers, car removals, etc. through our office phone number 07 3082 6442. For further information, mail us. I contacted WeCashCars.com.au on a Tuesday afternoon. Their representative gave me a fair quote on the phone. By two o'clock the next afternoon, my junk vehicle had been picked up, and I had a check in my hand. ***** 5 Star Awesome first experience. The tow truck came at the right time. The whole process was simple, easy and convenient to sell my car. Hopefully, I can rely on them for a great experience for next time. Excellent service and quick response to my inquiries. Need Christmas Money? Sell Your Used Car!